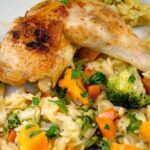 Roasted Chicken Leg Quarters with Vegetable Orzo, a light and healthy dinner that is ready in well under 40 minutes. 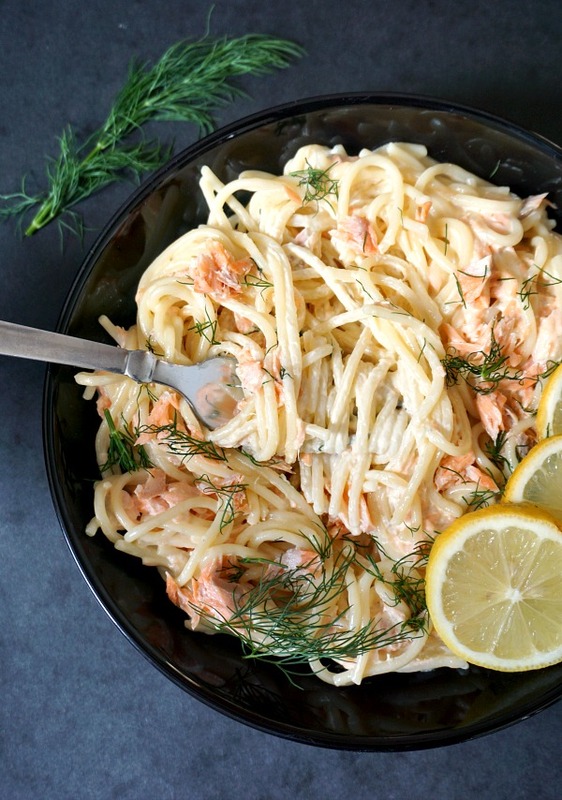 It’s delicious, super easy to make, and it goes well with the whole family. Can you believe that I have never cooked orzo before? It’s a short-cut pasta shaped like a larger long-grain rice, so if you like both pasta and rice, you get to have them both in the same dish. It cooks pretty fast, and for this dish I used one part orzo, and two parts chicken stock. Since it was cooked with vegetables and I wanted the liquid to be absorbed when the orzo was cooked, but it you cook it plain, you can just drain the liquid if there’s more left. Orzo is so versatile, and can be cooked in endless ways, from salads, stews, soups or only with some good old tomato sauce. But throw in some nice veggies, and have some roast on the side, and you have a complete meal without spending a fortune on it. With the days getting colder, it’s time we went back to some nice cooked food to keep us going. I can’t believe it’s October already. But hold onto those christmassy stuff yet, it’s way too early still. I have lots of healthy chicken recipes, from chicken breast, to chicken thighs, chicken wings or drumsticks, but I don’t usually go for roasted chicken leg quarters, for some unknows reasons. They are beautifully tender, and the meat is tastier than chicken breast even. And they are actually quite cheap too. 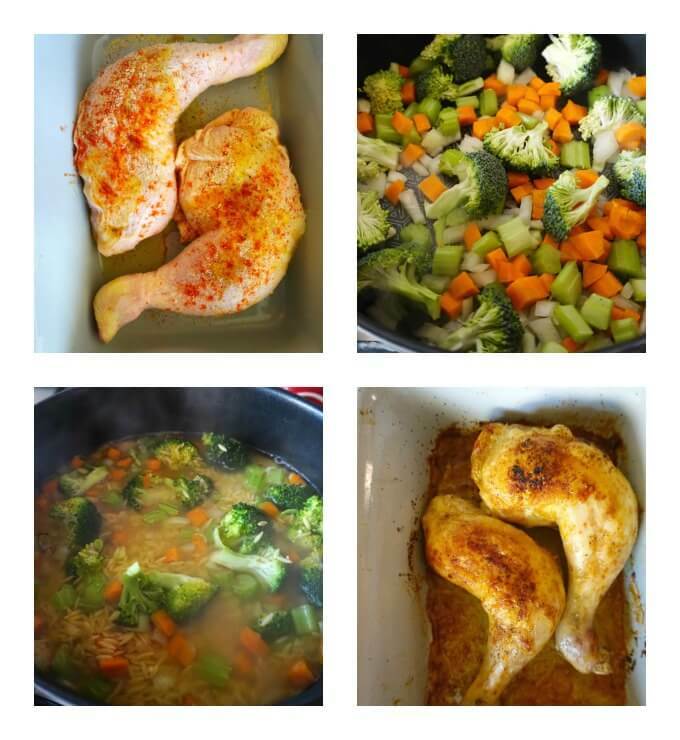 If you have leftovers, you can always used them for some nice Cheesy Chicken Rice Broccoli Casserole or Homemade Cream of Chicken Soup. How do you make roasted chicken leg quarters? Simply place the chicken leg quarters in a baking dish or tray, season generously with salt and pepper, and use any herbs or seasoning you like, I like the combo granualted garlic and paprika, it’s simple, but super delicious. Don’t go crazy on oil, just a teaspoon or so will do, there will be some juices left from the chicken in the pan, in case you like to serve it with some nice gravy too. Bake for 3-35 minutes at 200 degrees Celsius (390 Fahrenheit). As for other sides, plenty to choose from, roast potatoes , garlicky green beans, or some nice chickpea salad. 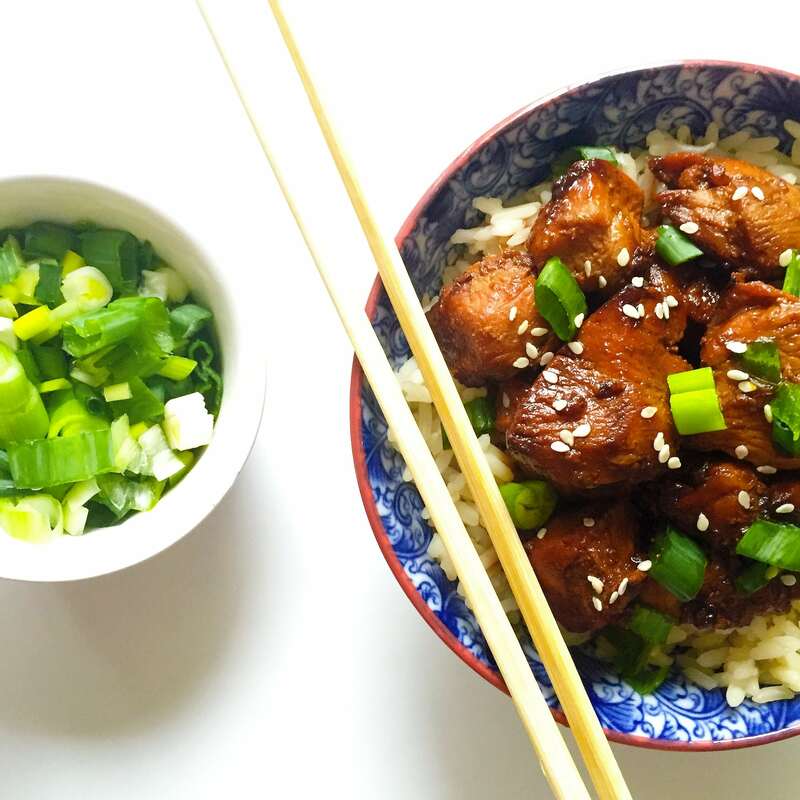 Quick, easy and so yummy! 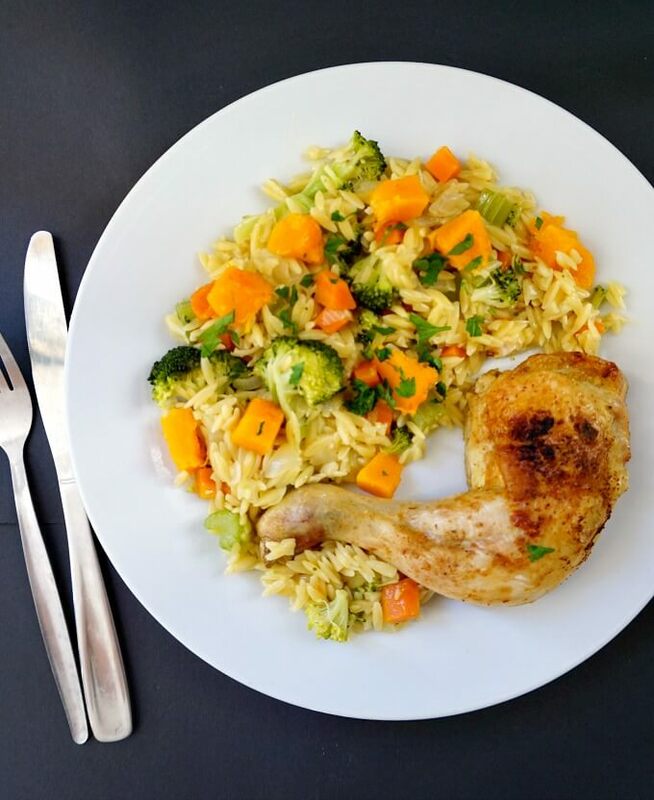 If you’ve liked my ROASTED CHICKEN LEG QUARTERS WITH VEGETABLE ORZO or any other recipe on the blog then don’t forget to rate the recipe and let me know how you got on in the comments below, I love hearing from you! You can also FOLLOW ME on FACEBOOK, and PINTEREST to see more delicious food and what I’m getting up to. 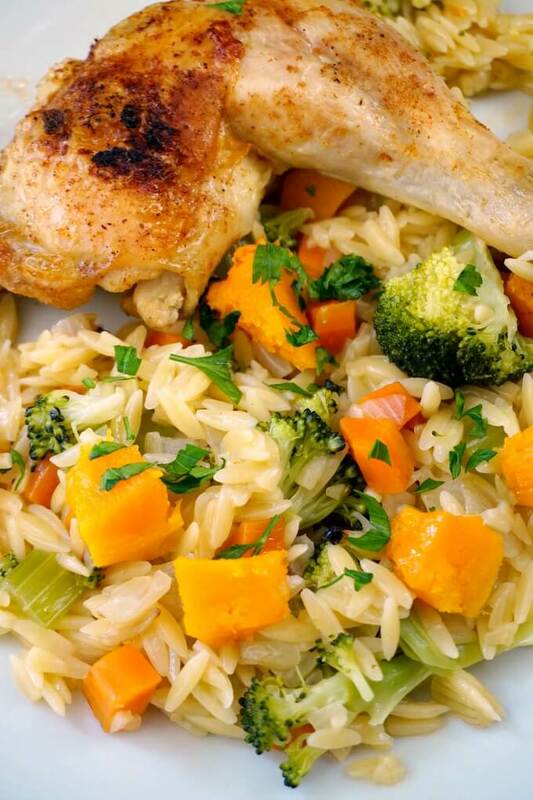 Roasted Chicken Leg Quarters with Vegetable Orzo, a light and healthy dinner that is ready in well under 40 minutes. 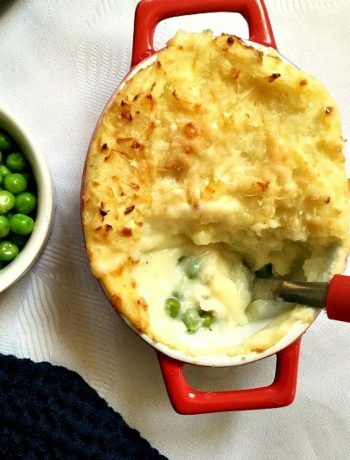 It's delicious, super easy to make, and it goes well with the whole family. In an over-proof dish, place the chicken leg quarters, season with salt, pepper, garlic granules and paprika, and drizzle over a teaspoon of oil. Roast for about 30-35 minutes until cooked through. You can turn the chicken leg quarters onto the other side half the way through roasting. Meantime, peel and chop the onion, carrot and celery stalks, and add them to a pan together with the broccoli florets and the remaining oil. Stir for about 5 minutes until they soften a bit, then add the orzo and chicken stock, and cook for about 15 minutes or so with the lid on until the orzo is cooked, and the vegetables are tender. Add the cooked butternut squash, and garnish with parsley. If you don't have any leftover roasted butternut squash, you can use fresh squash, and cook it at the same time with the other vegetables.